The goals of these interactive (didactic and experiential) workshops are to increase participants knowledge and skills in providing clinical supervision. This will be accomplished by addressing supervision principles, models, and techniques for group and individual supervision. Ethical, legal, relational power, cultural, individual and organizational influences will also be covered. The workshops will help participants develop new, and enhance existing, skills. This workshop series will increase participant’s performance in providing supervision to varying supervisee populations, within differing areas of service delivery. All workshops run from 9 a.m. - 4 p.m. Registration starts at 8:30 a.m. Price on or before July 15, 2019 is $475.00 for the entire conference. Price between July 16, 2019 and July 27, 2019 is $520.00 for the entire conference. NOTE: All 3 workshop days and 1 home study course (total of 24 hours) are required. 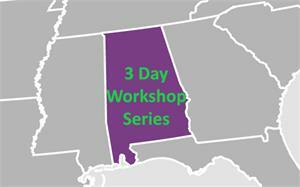 This workshop series has been submitted to, and accepted by, the Alabama Board of Examiners (ABEC).